Pluto, originally the 9th planet was discovered in 1930. Since then, astronomers have searched for a 10th planet beyond the orbit of Pluto. Until recently, all that's resulted from this are number of unconfirmed reports and a few crackpot theories. A number of trans-Neptunian objects (TNOs) -- objects farther away from the Sun than Neptune -- were discovered since 2000, but all were much smaller than Pluto and its moon Charon. In 2002, Quaoar, a trans-Neptunian object with an estimated size larger than Charon was discovered by Chad Trujillo and Michael Brown, astronomers at Caltech. A year later, another TNO, Sedna, was shown to be nearly two-thirds Pluto's size. In 2003, Trujillo and Brown discovered yet another TNO. This one has now (2006) been officially names Eris (after the goddess of discord (previously labeled 2003UB313 and nicknamed "Xena" by its discoverers). It has an estimated diameter at 2700 km, larger than Pluto's 2320 km diameter. It also has a moon, Dysnomia (in mythology the child of Eris) and nicknamed "Gabrielle", discovered in 2005. In August 2006 Astronomers at the IAU debated the formal definition of a planet and created a new class, called dwarf planets of which Eris, Pluto and Ceres (the largest of the asteroid belt members) are the first members. They do not (under the new definition) get to be "classic" planets, as they are not large enough to dominate their orbits. Sedna and Quaoarare also members of this class, pending a formal confirmation of their shape. Another TNO, Makemake, which is three quarters the size of Pluto, was made a dwarf planet in 2008. In 2015, Caltech astronomers Konstantin Batygin and Mike Brown found theoritical evidence (not observational) of a giant planet about 20 times farther from the Sun than Npetune on average. The prediction of the so called Planet 9 is mathematical and could explain the unique orbits of at least five smaller objects in the outer Kuiper belt. 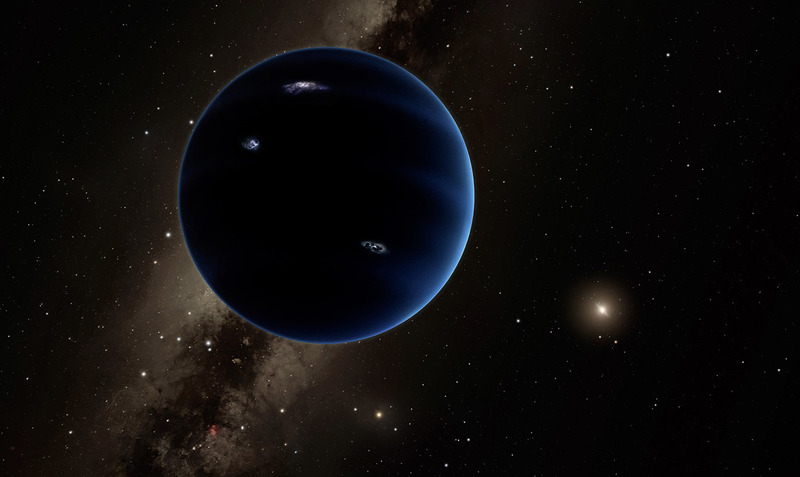 As of January 2019, no observation of Planet Nine has been announced.